There are all sorts of rumours on Internet cruise forums and elsewhere about the future of the QE2, which is sitting at a quayside in Dubai. None of us knows if any are true, and what the future holds. Will she be converted into a luxury hotel, as her new owners promised, or will she be scrapped because the money is not there any more? There’s little point in speculating at this stage. What I do know is that the QE2’s funnel is for sale on ebay – well a replica, at least. The 30 cm tall plastic model was one of several used as table centre pieces at a dinner held by the Dubai branch of the Nautical Institute earlier this month. 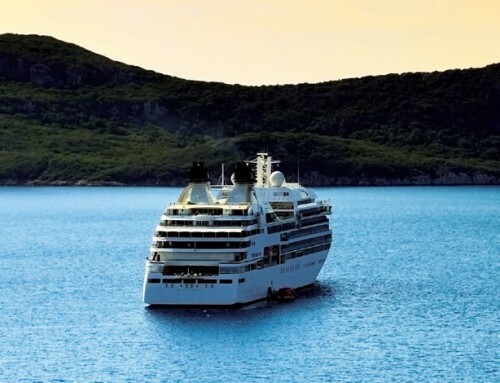 This one has been signed by Commodore Ron Warwick, a former captain of the QE2. At the time of writing it has attracted 26 bids and reached a price of £137. If you fancy getting your hands on it, you have until March 30 to place your bid. Don’t all rush at once. I do not know if you are aware, the funnel on the QE2 is not from the original build (from John Brown Shipyard), so whats the big deal ! other than who ever buys the funnel, if true should do there homework. 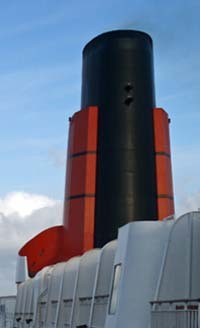 The QE2’s funnel IS her original John Browns one, but adapted in 1987 to accomodate the diesel uptakes.